"This is a family favorite and really yummy." Cut chicken breasts into strips. Whisk egg and juice together in a medium bowl. Stir in molasses and honey. Dip chicken strips into egg mixture. Pour cracker crumbs into a resealable plastic bag. Put egg coated chicken pieces in bag, seal and shake to coat with crumbs. Place breaded chicken on a foil-lined cookie sheet and bake in the preheated oven for 10 minutes. Flip the chicken strips and turn the pan, then bake for another 10 minutes. See how to roast chicken until crispy on the outside and juicy on the inside. This was simple and the grandkids loved it! 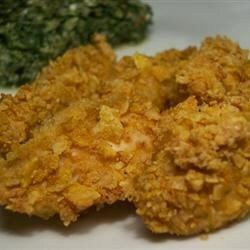 I might even try this using Italian Seasoned breadcrumbs for a totally different flavor. Absolutely wonderful. I didn't have any honey, so I used a little lemon juice. They were a BIG hit! !